Ninety years ago the first Hinckley yachts took to the waters of Southwest Harbor, Maine in the United States quickly gaining a reputation for incredible strength, seaworthiness and, a rarity then as now, exceptional craftsmanship with a simple, elegant beauty that turned heads in every harbour. By the end of the 1950s, Hinckley was the largest producer of sailing auxiliaries. Unknown to many even now, Hinckley pioneered the use of fibreglass in boat building. We understood its potential in strength and longevity and saw in the lightweight of the composites the opportunity to achieve something remarkable. Today Hinckley remains at the forefront of integrating the latest technologies. Carbon fibre has now replaced fibreglass. We were one of the first American builders to adopt SCRIMP resin infusion and today we remain a world leader in single bond infusion which allows for a single chemical bond between hull and support structure. With our move to epoxy resin infusion this year, we are now building with a resin material of 40% greater strength and improved environmental benefits. Our time honoured and highly protected single bond, vacuum-infusion process chemically bonds carbon and epoxy from bow to stern for incredible strength and durability. The embrace of technological advancements and our deeply held, time-honoured commitment to doing things the right way define what a Hinckley yacht is today. Designed from the outset for fully electric propulsion, Dasher achieves a new standard of excellence pairing modern styling with hi-tech composite construction. Every ounce of weight has been shaved and every curve sculpted. 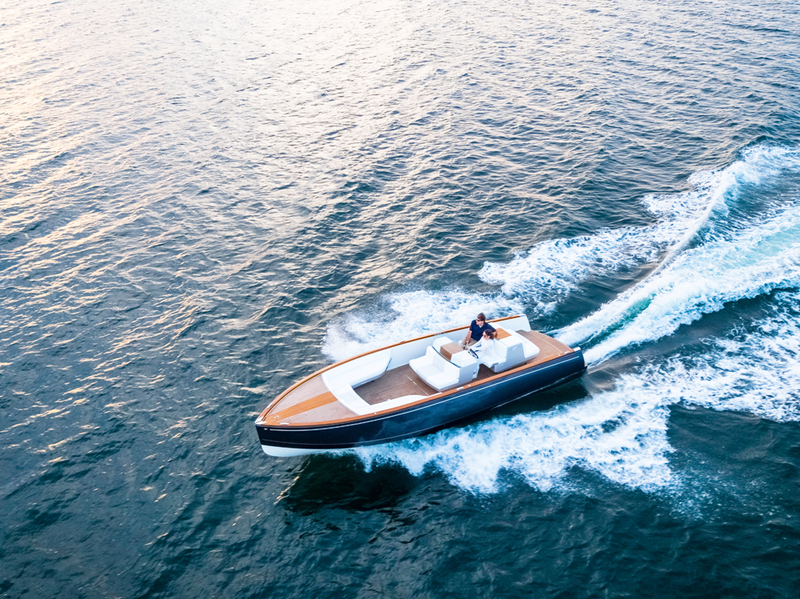 Borrowing her name from the game-changing, original Picnic Boat hull #1, Dasher sports a carbon-epoxy composite hull shape designed by Michael Peters to achieve superior performance and handling. Twin 80hp electric motors and dual BMW i3 lithium ion batteries power Dasher’s 8.7 metre length. 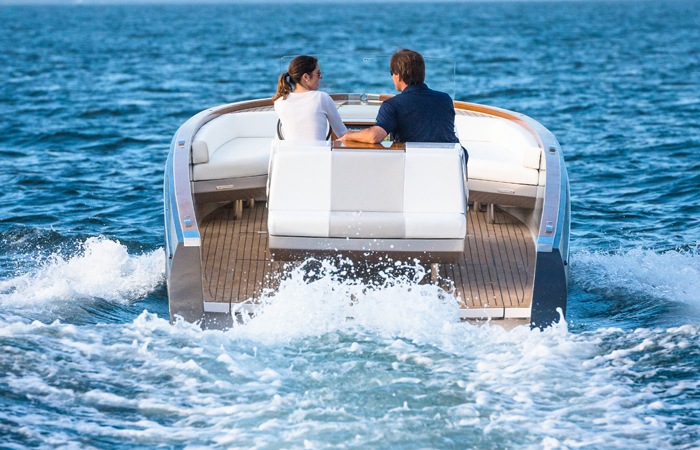 Hinckley’s Whisper Drive silent propulsion system combines the latest hydrodynamics, electric power and digital control systems to achieve the performance handling and manoeuvrability that discerning clients expect. With hand-painted, lightweight artisanal teak, Dasher has Hinckley’s signature varnished teak look without the weight or maintenance costs of traditional varnished teak wood. Titanium hardware and console details were 3D printed to achieve shapes at a level of precision unavailable in typical construction methods. Dasher’s console is designed to allow the Captain to join the party. A retractable windshield makes it easy to connect with guests, even while at the helm. The touch screen panel makes navigating and controlling the yacht equally simple. The open layout allows for numerous possible configurations. Quiet propulsion, zero emissions and zero time lost at the fueling dock make Dasher the best way to spend time on the water with family and friends. Dasher accepts dual 50 amp charging cables, standard on most docks, so it can charge twice as fast as the most popular plug-in electric cars. Dasher gains a full charge in under 4 hours with dual 50amp charging. Her cruising speed is 8.7 knots with fast cruising at 15.6-23.5 knots. Range is 64.37 kilometres at cruising speed and 32-30 kilometres at fast cruising speeds.